Gomeroi gaaynggal Centre’s Possum Skin art, Tamworth 2018 NAIDOC Exhibition, Because of Her, We Can! At the Tamworth Gomeroi gaaynggal Centre, all works have been created by Aboriginal women, who belong to the ‘Gomeroi gaaynggal’ mothers’ art and health program. We spoke with three women employed by the Centre about their work and the Centre. Can you tell us what to expect at the 2018 Gomeroi gaaynggal Centre’s NAIDOC exhibition at Ray Walsh House in Tamworth this year? 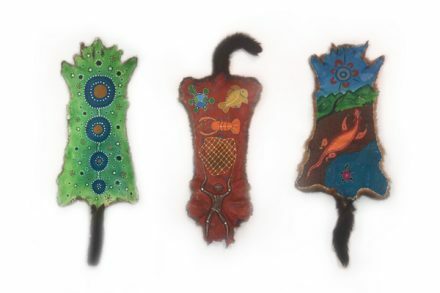 This exhibition and possum skin project was developed to create possum skin artworks depicting an important story of the artist’s life. Possum skins were traditionally given at birth, and as the child grew, additional skins were added during significant life events to eventually create a cloak they had for life. All skins were sustainably sourced from New Zealand. This year, the National NAIDOC Committee announced the theme, Because of Her, We Can! Can you talk to what it means to you – personally and through your work? The 2018 NAIDOC theme, Because of Her, We Can! reflects the ethos of the Gomeroi gaaynggal Centre. The staff at the Gomeroi gaaynggal Centre are very proud of the ongoing support the Gomeroi gaaynggal Centre gives to mums and their children, school students, community members, and the help to improve further generations with their health and their cultural identity. What advice would you give to young Aboriginal practitioners looking to start their career in the Arts? Work hard, believe in yourself and be committed to your goals. Open your mind to different creative processes and techniques to develop your art making skills. Continue to grow the Gomeroi gaaynggal Centre’s ArtsHealth programs to provide support to the local community and highlight the importance that art plays in improving social and emotional wellbeing, whilst developing artistic skills of those who attend our programs. The Gomeroi gaaynggal Centre, University of Newcastle, is a vibrant community Indigenous arts studio, gallery space and research centre. Gomeroi gaaynggal ArtsHealth programs support women aged from their early teens through to Elders and provide a safe and culturally appropriate space for women of all ages to create art and connect with each other, their culture and their local Indigenous community. The centre also runs workshops for young Indigenous people in the area which aim to connect the next generation more closely to their culture. The Gomeroi gaaynggal Centre employ three Indigenous Gomeroi women who are all artists in their own right. Foyer of Ray Walsh House Tamworth 2018 NAIDOC exhibition, Because of Her, We Can! As part of the National exhibition, the third Tamworth Textiles Triennial with the Gomeroi gaaynggal doll-makers. As part of the national exhibition, third Tamworth Textiles Triennial as part of the Gomeroi gaaynggal Exhibition. Foyer of Ray Walsh House, Tamworth 2018 NAIDOC exhibition, Because of Her, We Can! NAIDOC Week on NITV & the ABC is looking deadly!